Fire pits can't be beat for adding a touch of ambience and warmth to your outdoor activities; these are the wood and gas fire pits that owners say are tops when it comes to durability and ease of use -- and most look terrific, too. 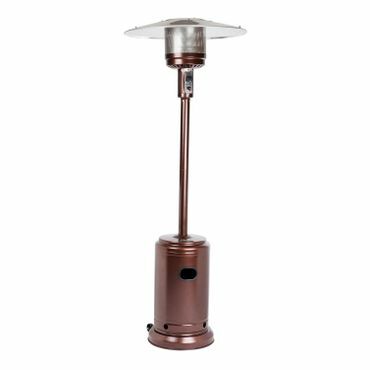 And if you are more interested in heat than fire, we found some powerful patio heaters that will keep you toasty on a brisk fall night. If you want the ambience and fun of a roaring campfire without the nuisance and cleanup of burning wood, the Heininger 5995 might be just what you are looking for. At 19 inches across and weighing just 22 pounds, it's just small and lightweight enough to be brought along on outings to the park or beach. Tailgaters love it, too. 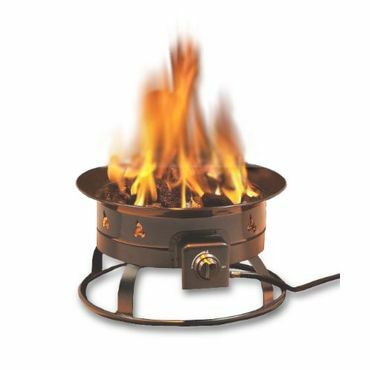 The Fire Sense Propane Table Top Patio Heater is a reasonable choice if you need a heater for a small space or to take with you for tailgating, picnics or the like. There are some gripes about less than ideal build quality and low heat output -- not surprising considering that it's only rated to produce 10,000 BTUs -- but most owners say that it does a great job warming up smaller spaces. Whether they're plain or fancy, a wood-burning fire pit's main function is to safely contain a fire. Design choices are only limited by your -- and the manufacturer's -- imagination. 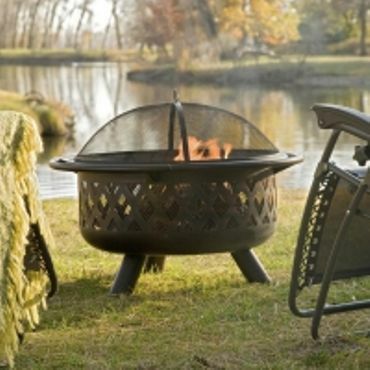 In this report, we discuss the most popular types of wood-burning fire pits -- freestanding units that are attractive, yet fairly affordable and easy to use. These are somewhat portable so that they can be placed as needed for an occasion or stored away once winter weather sets in. Some are relatively small and lightweight, so they can travel with you when you go on an outing or on vacation. Wood burning fire pits can also be permanently installed, but those are usually part of a larger design plan and are often customized. Fire pit tables incorporate a surrounding metal, stone, glass or ceramic surface that may be large enough to use for holding food or drinks. While wood-burning fire pits are inexpensive and versatile, gas fire pits have advantages of their own. Propane-fueled fire pits are easier to light than wood-burning models, they produce less smoke and soot, and you don't need to deal with the ash and debris that remain after the fire is extinguished. They can also produce quite a bit of heat -- some are rated to produce as many BTUs as a propane patio heater. However, they tend to be quite a bit more expensive than wood-burning fire pits and are generally not portable, or even very easy to move around. 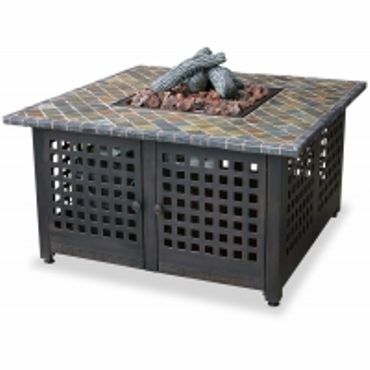 Some, especially stone gas fire pits, are designed to be permanently installed on your patio. 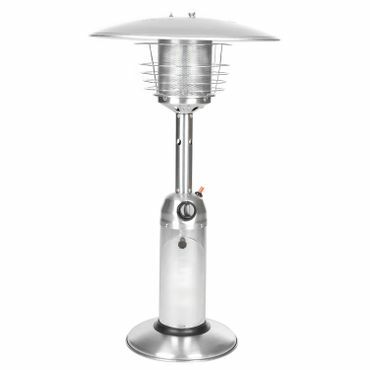 If you are more interested in heat than ambiance, a patio heater might be right for you. 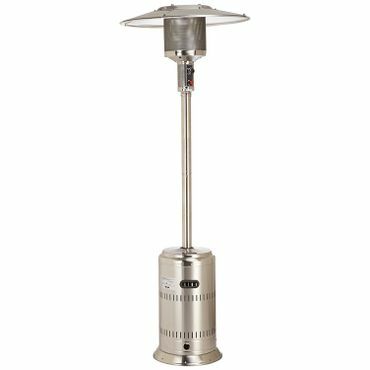 Most patio heaters burn propane, also called LP gas, from the same kind of refillable tanks used by gas grills and propane fire pits. Free-standing models, which cost between $100 and $300, stand a bit over 7 feet high and can warm up people within 5 to 10 feet of the heater. Smaller tabletop models, which draw their fuel from disposable canisters rather than refillable tanks, are also available. These are priced between $100 and $200. However, table top patio heaters often don't receive the best feedback as they produce less heat than the large freestanding models, leading to disappointment for some, especially those who don't understand their limitations. Those who want to avoid dealing with propane and propane tanks can opt for electric patio heaters instead; these use either infrared or halogen bulbs to generate heat. 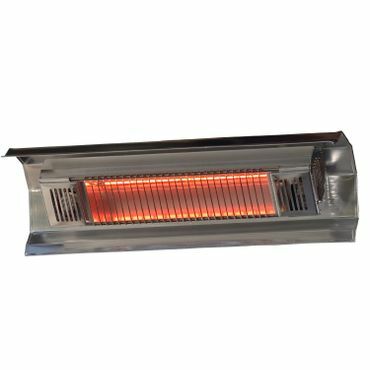 Electric patio heaters, which can cost anywhere from $100 to $450, are relatively inexpensive to run and eliminate the hassles of dealing with propane, but put out less warmth than most propane models, including tabletop propane heaters, again leading to less than stellar user reviews in many cases. "15 Outdoor Fire Pits Made for Entertaining"
"Here's How To Find The Best Fire Pits For Entertaining Outdoors This Fall (PHOTOS)"
Credible, expert reviews of patio heaters are hard to find, but you can read some good general advice regarding fire pits and outdoor fireplaces at sites such as HGTVGardens.com and The Huffington Post. These resources don't recommend specific models, but offer helpful information so that you can figure out what type of fire pit will work best for your needs and budget. Other resources, such as Architectural Digest, do name some top fire pits, but don't adequately describe how they came to their conclusion. Because of that, we relied primarily on user reviews from retail sites such as HomeDepot.com, Lowes.com Amazon.com and Hayneedle.com to find the best models. We looked for fire pits and patio heaters that are sturdy, easy to assemble and use, and include important safety features. 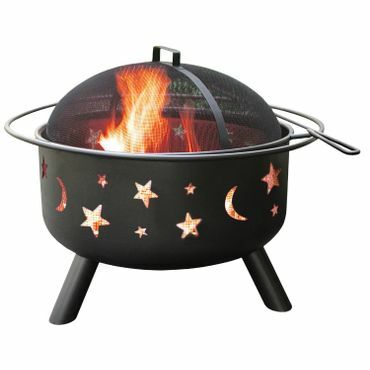 We also factored in manufacturer warranties and the quality of customer service to compile our list of the best fire pits and patio heaters. Regardless of your needs and budget, it's likely that one of these will be perfect for your setting and situation.